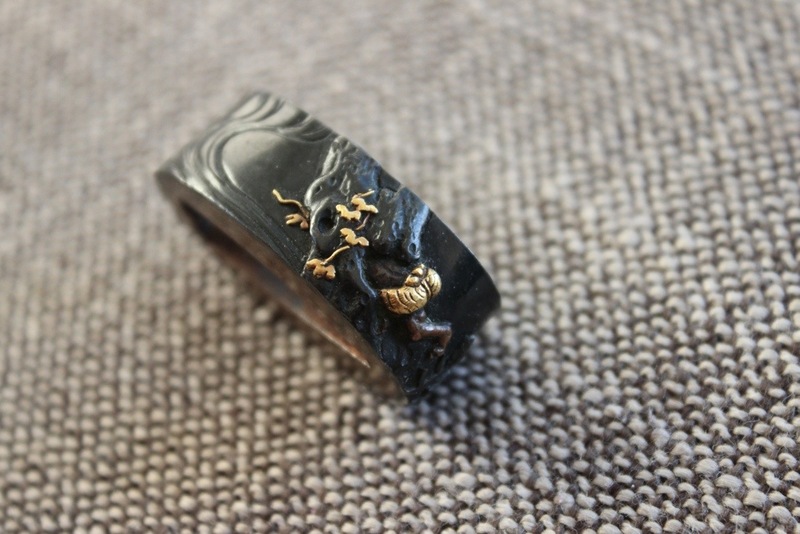 Shakudo Fuchi Kashira featuring design of Shoki “the demon queller” and Oni in gold and copper. Mumei. Late Edo period. Remarkably well crafted with amazing detail. One of the best I’ve seen on this theme. 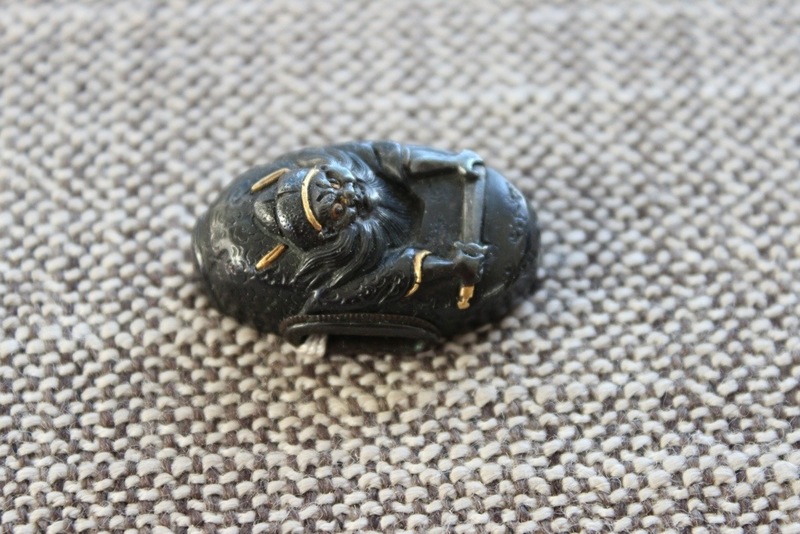 I really like the way Shoki is coming up out of the kashira plate. I also like the way the Oni is trying to hide from Shoki by putting his head into a log. 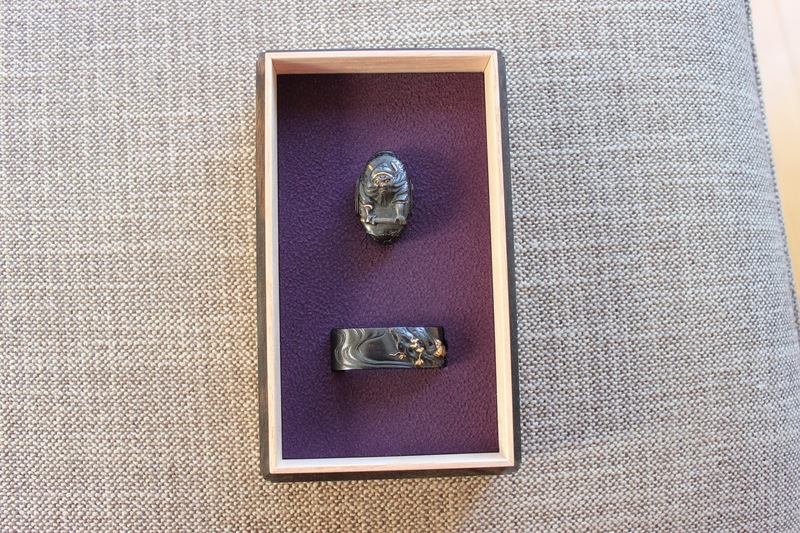 Robert Haynes said the following about this Fuchi/Kashira “… a classic Hamano school set. I am surprised that it isn’t signed. So there is no way of knowing who made it. As nice as it is, the maker should have signed it”. The concept of signing tosogu was not known until the advent of the Nobuie school during the Momoyama period. None of the Goto masters signed their works until around 1600, and even then it wasn’t customary. After 1600 it gradually increased until practically everything was signed, the exception being work done for the Daimyo, which still usually were not. The machibori artists tended to sign all of their works. Perhaps the Hamano artist who made this set made it for someone of status and therefore decided not to sign his name. 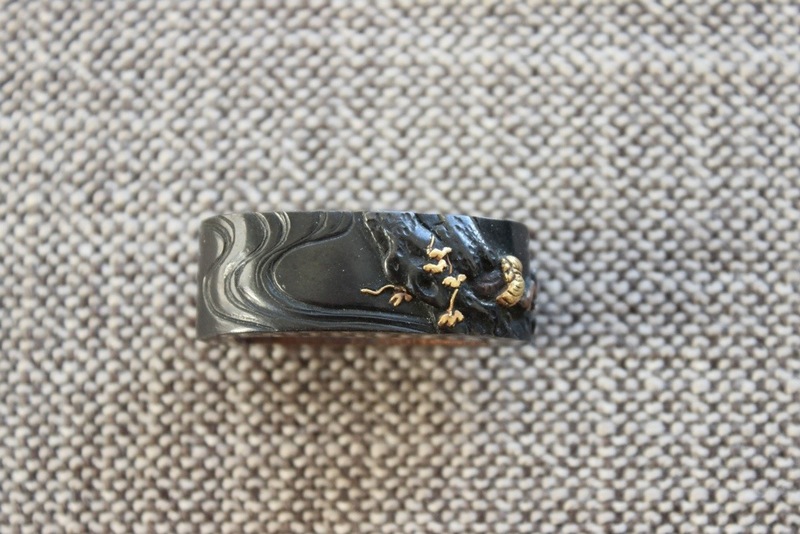 Hamano Masayuki (1696-1769), a pupil of Nara Toshinaga founded an important school which worked in the spirit of the Nara masters, but stands out boldly in its prolific use of softer metals and alloys and the beauty and vividness of its designs. The Hamano workers employed a wide variety of colours and mostly portrayed scenes of historical significance and human interest. They displayed a tendancy to higher relief than is found in the generality of Nara work, though they also sometimes employed the shishiai-bori or sunk relief technique of the school of Joi. Shoki is a legendary Chinese diety who protected Tang-era Emperor Xuanzong (685-762) from malevolent demons. According to this legend, Shoki appeared to the sick emperor in a dream and subdued the demons causing his sickness. In gratitude, the emperor awarded Shoki the title of “Doctor of Zhongnanshan”. Shoki wanted, above all else, to serve as a physician in the imperial palace, but when he failed the national exam he committed suicide in despair. Emperor Xuanzong heard this story, and in pity ordered Shoki to be buried in the green robe reserved for the imperial clan. 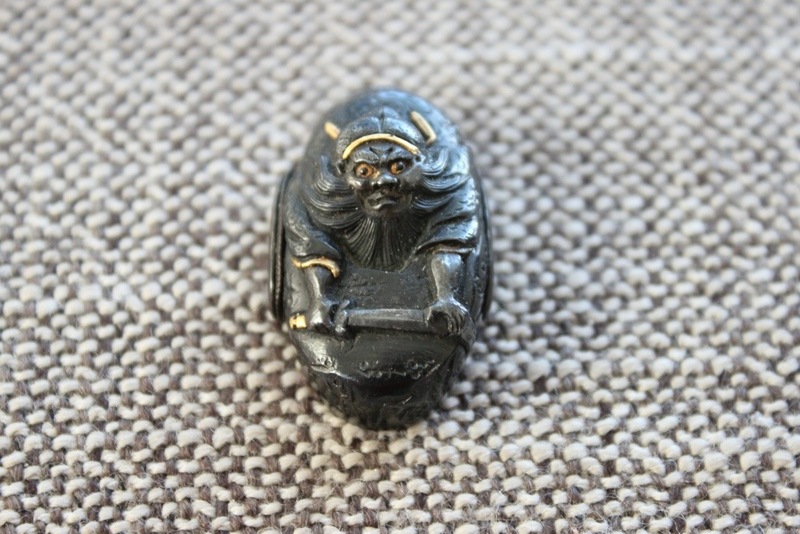 Shoki’s spirit vowed to protect the ruler and all male heirs from demons of illness and evil. Shoki’s popularity peaked in Japan during the Edo period, when people began to hang images of Shoki outside their houses to ward off evil spirits during the Boys’ Day festival and to adorn the eaves and entrances of their homes with ceramic statues of the deity. Today, Shoki is a minor deity relatively neglected or forgotten by most Japanese, except perhaps in Kyoto city, where residents still adorn the eaves and rooftops of their homes with Shoki’s effigy to ward off evil and illness, and to protect the male heir to the family.